We tip our hats off to you in thanks, and look forward to seeing you (and your hat) on the 30th of April! A badge with a special design to thank you for your contribution. 80x54mm. Includes only national shipment, contact us if you want to know the cost of shipping outside of Spain. We will send you 4 special badges FRIEND OF THE PASSEJADA to hand out among your friends and family! Includes shipping within Spain, contact us if you want to know the cost of shipping elsewhere. 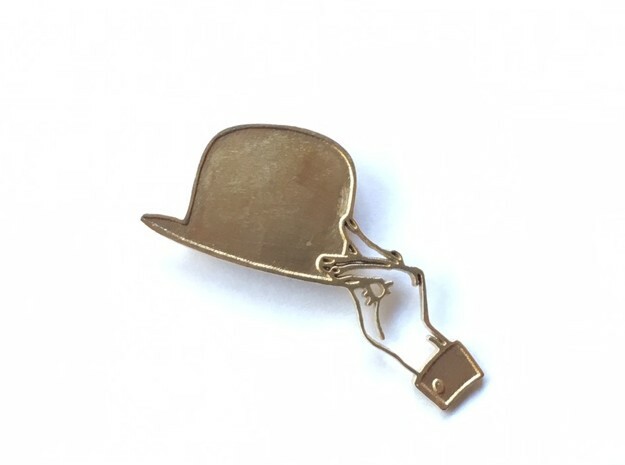 Figurative brooch of a hand doffing a hat. Exclusive design. You can choose between black, green and dark pink. If you don't indicate a preferred color you will receive the black one. Plastic material. Shipment within 2 weeks. Includes the FRIEND OF THE PASSEJADA badge. Includes shipping within Spain, contact us if you want to know the cost of shipping elsewhere. 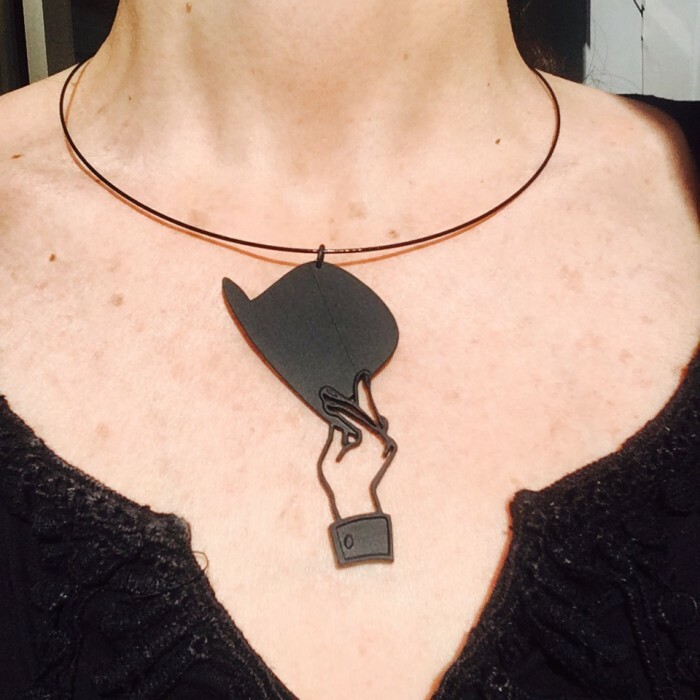 Pendant made of black plastic in the shape of a hand doffing a hat. with a semi-rigid chain. Exclusive design. Includes shipping within Spain, contact us if you want to know the cost of shipping elsewhere. Also includes the FRIEND OF THE PASSEJADA BADGE. ORIGINAL LITHOGRAPH FROM THE 1930's "He who covers his head shows good personal taste"
Sent unframed, includes national shipment. Early work by the Spanish-born artist, Luis (or Louis or Lluis) Molné (born Lluis Vidal Molné). He went into exile in Monaco in 1939, was renowned in his time for his ceramic mural painting in the old Monaco train station. He had the patronage of the Monegasque royal family. He was particularly noted for his illustration work. BRASS BROOCH "HATS OFF TO YOU!" 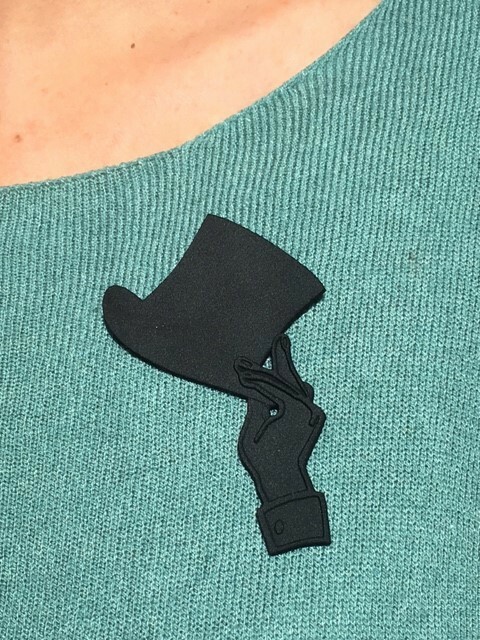 Exclusive brooch in the shape of a hand doffing a hat. Only 10 units available for the best friends of the Stroll with a Hat! Made out of brass. Shipment within 3-4 weeks. Includes a Friend of the Passejada badge. Includes shipping within Spain, contact us if you want to know the cost of shipping elsewhere. DINNER WITH THE ORGANIZERS AT THE CERCLE DEL LICEU RESTAURANT. Only 8 spots! 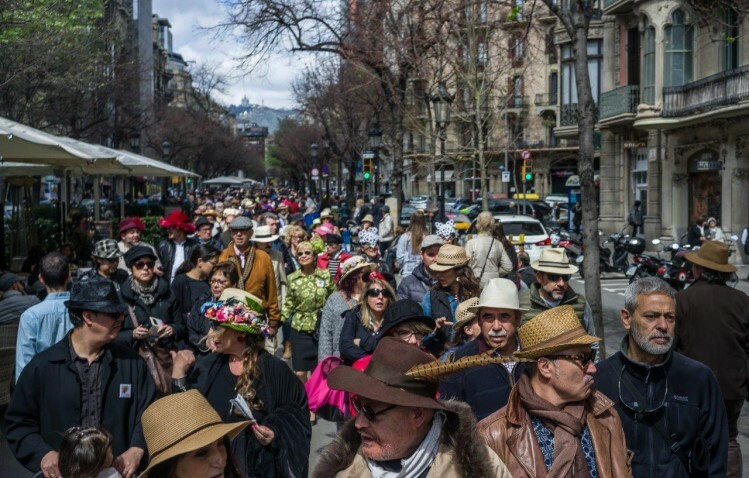 Thanks to the cooperation of one of this private club members, you will be able to take a unique glimpse at the Cercle del Liceu (the club adjoining Barcelona's Opera House) and talk about hats. This dinner will take place after the Stroll with a Hat, making an effort to accomodate everyone in what concerns dates (men:tie and jacket are required). Includes a "friend of the Passejada" badge. For stores or businesses that wish to back the Stroll with a Hat. 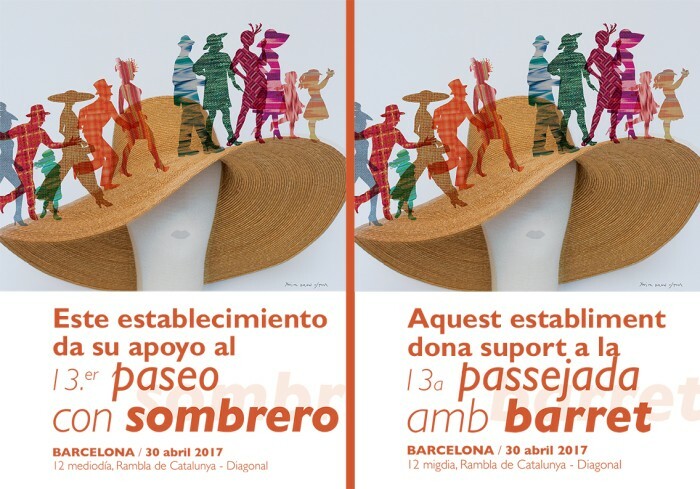 You will receive an A5 electrostatic adhesive for your window -to choose between Catalan and Spanish language- "Aquest establiment dona suport a la Passejada amb Barret" + 4 badges + posters + flyers. Your logo will feature in a special section of the Stroll's website, Your business will be mentioned on social media. If you're a shop doing special discounts for this event, we will spread the word. Wear your hat and join us! 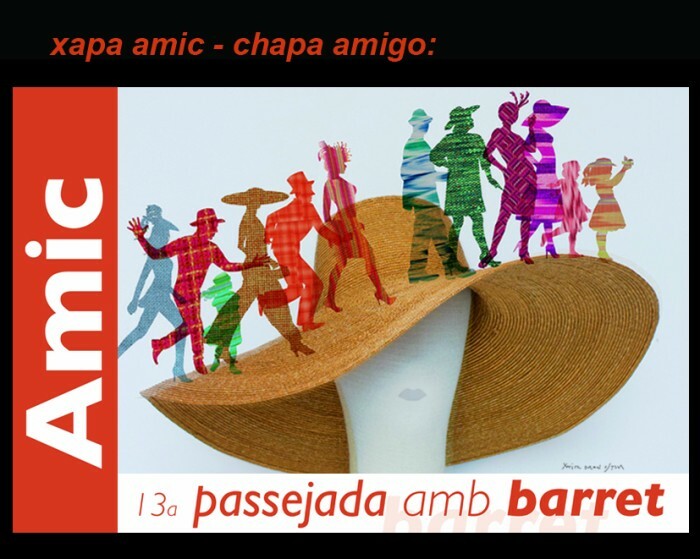 We need your enthusiasm and support to guarantee the continuity of the Stroll with a Hat. 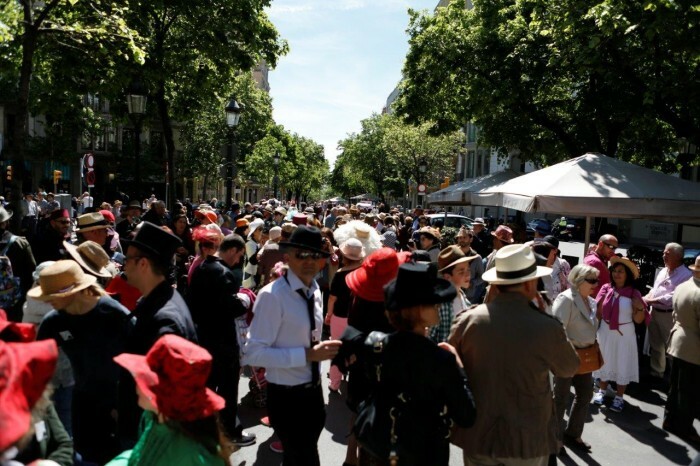 Ever since the 4th edition of the Stroll with a Hat, a commemorative badge is given away to the participants. These badges have the image of the poster and a very special square format of 52x52mm. To get one one just needs to wear a hat and take part in the event. The badges are also an essential tool to count the number of participants. We would like to keep on giving away the badges, but with the number of strollers on the rise in such a spectacular manner the costs have also risen. With your help we will be able to maintain this tradition. 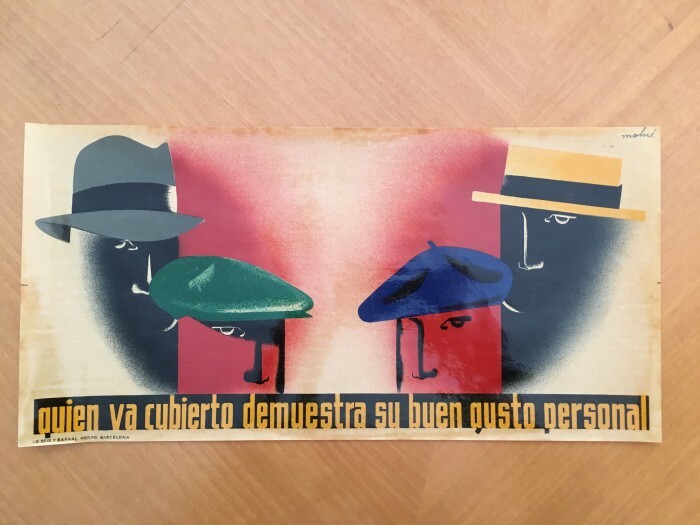 It's vital to have posters with the image of the Stroll in order to promote and distribute them through out the city, as well as flyers, cards and press dossiers. The cost of the rewards: badges, brooches, pendants, dinners, adhesives, packing, shipping, bank expenses and the Goteo commission. 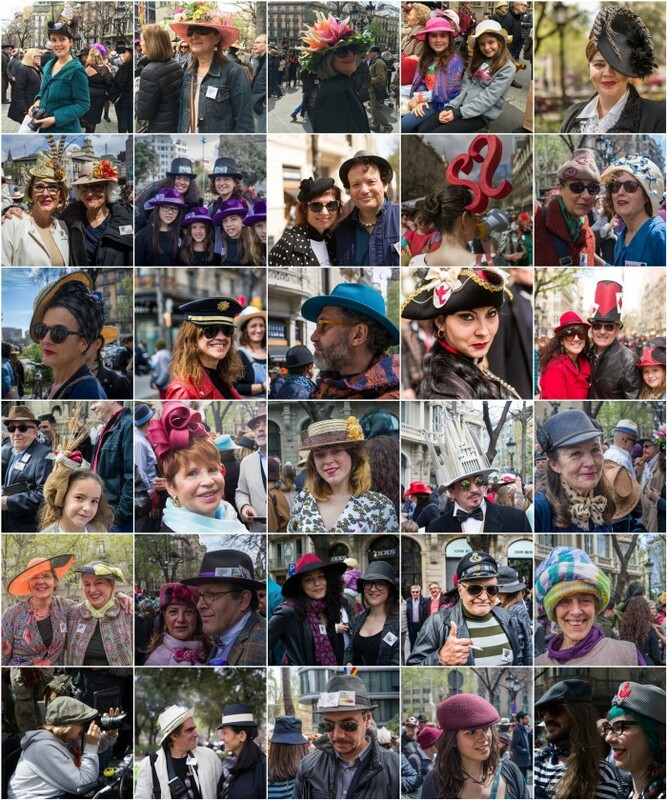 There are people, hat lovers, who have never heard of the event! We must remedy this. 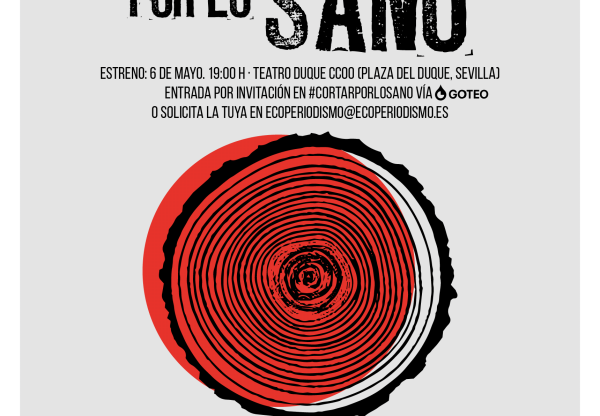 We'd like to advertise on Facebook (promoting the event to reach more people from Barcelona) and also in the local press. If we’re too late to do it this year, we will do it next year. A money cushion that will allow us to pay for miscellaneous and unforeseen expenses, tasks that up to know have been done for free but that it would be fair to pay for, even if it's at a friendly rate. Whatever is left will be used to finance future Strolls. 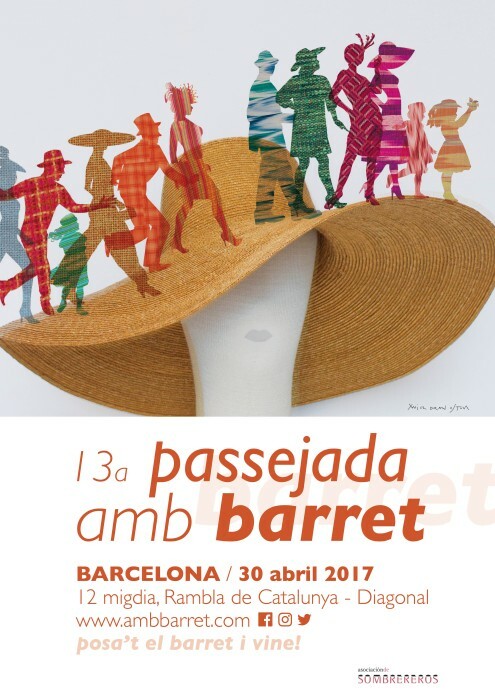 Barcelona’s Passejada amb Barret (Stroll with a Hat) is a day for everyone, a fun and relaxed gathering in which thousands of people come together to wear their hats. 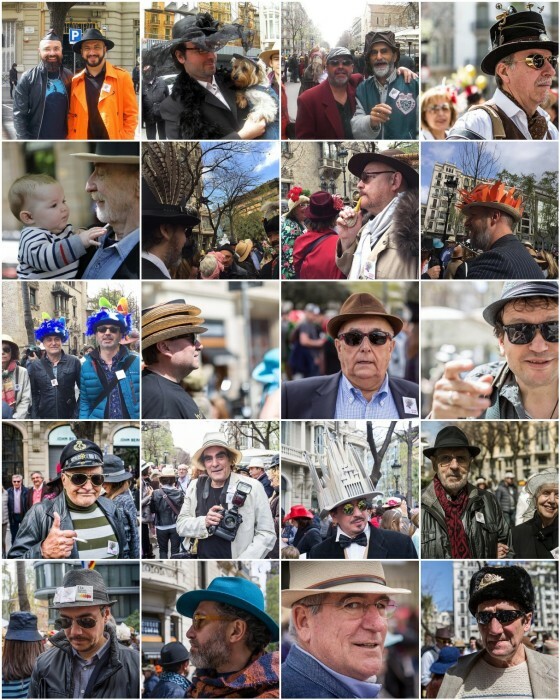 From wildly inventive to elegantly discreet, young and old, all unite to show their love of hats. This year’s edition takes place on Sunday 30th of April 2017 and to accommodate the large number of participants, instead of starting and ending at set points like in previous years, the participants will stroll at their leisure from noon, culminating in a farewell gathering at 2pm. 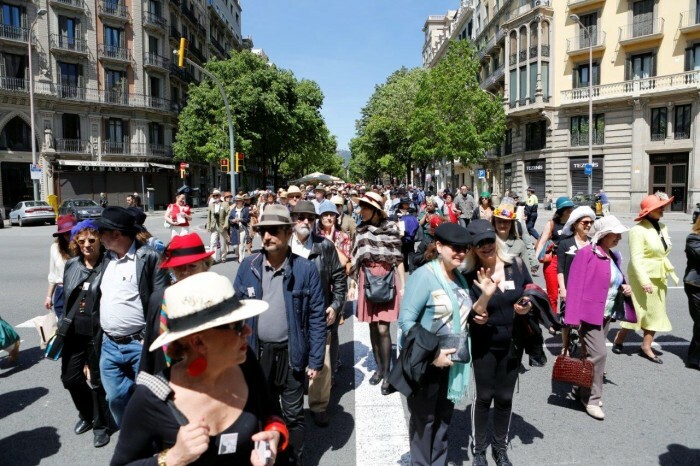 The setting of this very special day is the city’s most beautiful boulevard, Rambla de Catalunya, where between Diagonal and Gran Via, Barcelona will reclaim its splendour of yore and become, for at least a few hours, the world capital of hats. 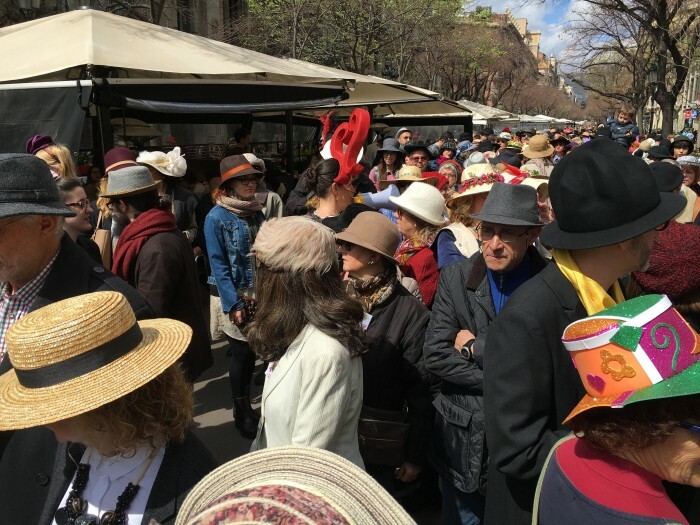 To guarantee the continued success of the Stroll with a Hat (which in its last edition attracted close to 2000 strollers) we need to print out the promotional posters as well as the flyers that will be handed out before and during the event. We also want to maintain the tradition of the free commemorative badge. We're not short on ideas, so if we collect more, every penny will be used on this project, either on this edition or in future ones. 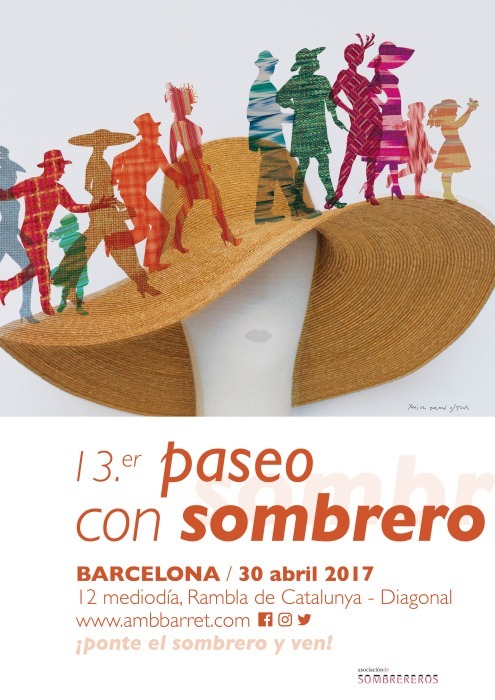 This project is for you, who likes to wear a hat and enjoys taking walks in Barcelona. 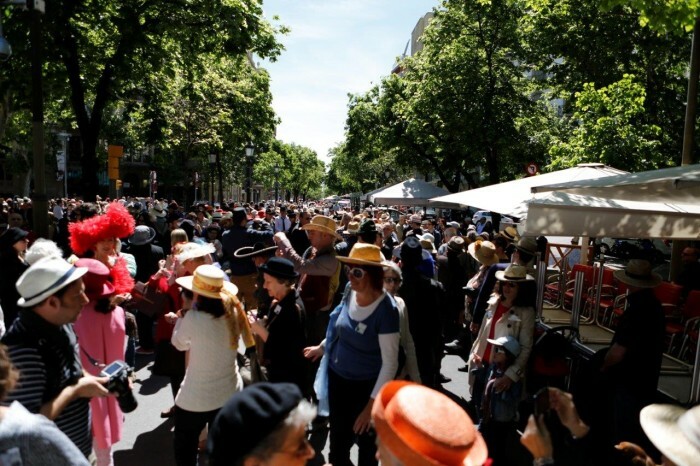 So that you can continue participating in this unique, fun and delightful event where people of all ages, styles, nationalities and walks of life get together and wear their hats. Whether they’re shy and wear a simple hat or extroverted and prefer extravagant headgear, everyone is welcome to join in! Increase the visibility of this great event. Collect enough money to pay for the posters, flyers and badges. With even more funds we would be able to promote the event in the press and put in motion other ideas that have come up but for which we had no funding. Any money left will be used for future editions of this event. Enlist help to complete different tasks that need to be done. 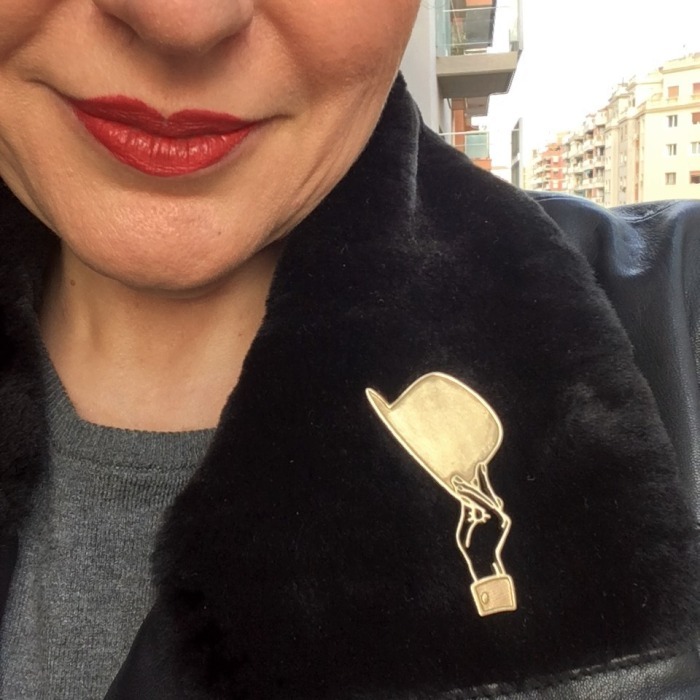 Cristina de Prada: I’m a milliner by trade, and my hats wish to define the individuality of the wearer and delight both the onlooker and those who wear them. With a Law degree, my heart has led me down the creative path designing and crafting haute-couture hats. On 2011 and 2012 I was finalist of the prestigious “Hat Designer of the Year” awards. I share my millinery knowledge on a blog that has become a reference in the world of hat making. Nina Pawlowsky: From being self-taught to learning from great experts (Stephen Jones, London and Lola Ehrlich, N.Y.C.) I’ve made of millinery a passion and a profession. Specialized in theater hats, I also make hats of my own design for all kinds of occasions. As a milliner one must be a sculptor, feather and flower expert, tight rope walker, inventor, alchemist and much more! On 2013 I was awarded the Millinery Master Craftsman charter. 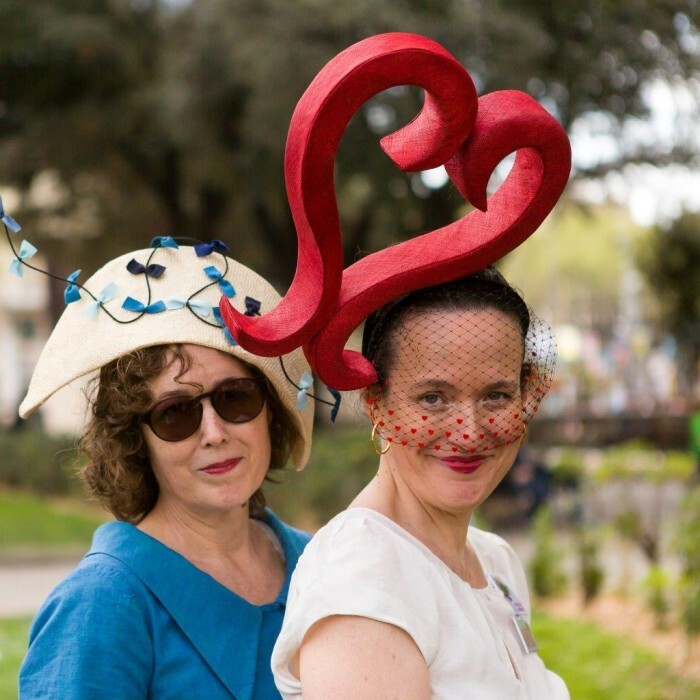 Together, Nina Pawlowsky and Cristina de Prada, we’ve been organizing for thirteen years Barcelona’s Stroll with a Hat, and we’re President and Secretary respectively of the Spanish Milliners Association. 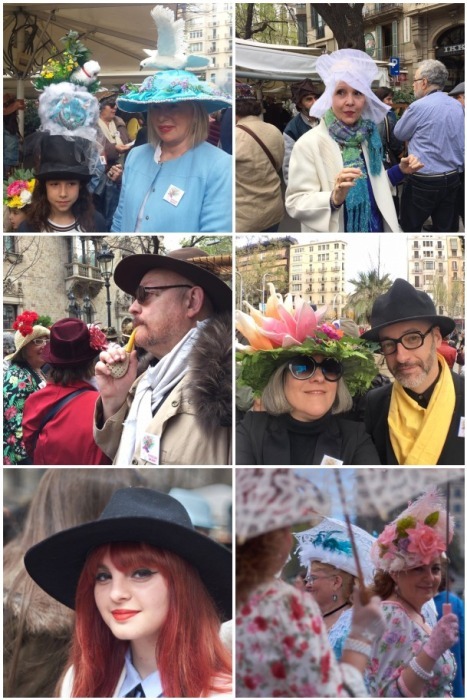 This project aims to unite thousands of people in a jovial and fun manner, so that in their diversity and uniqueness they can feel connected through their love of hats, creativity and Barcelona. Our commitment is to guarantee the continuity of this non-profit event for everyone’s enjoyment. We will let you know about our experiences and the steps you must take to organize an event like ours. Do you work in the press? Do you have a blog? We need your support to promote the event.